What's Next for Astronaut Chris Hadfield? 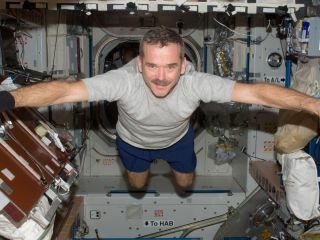 Canadian Space Agency astronaut Chris Hadfield, Expedition 34 flight engineer, floats freely in the Unity node of the International Space Station. Photo taken Dec. 31, 2012. With star astronaut Chris Hadfield recently back on planet Earth after five months in orbit, many are wondering what he will do next. Will Hadfield stay with the Canadian Space Agency? Bring his outreach skills to politics or business? Or do something different altogether? "It'll be fun, but also tough for him to make a decision," Garneau said. "I have no idea what his plans are. We are very good friends, but I've never asked. It'll be interesting to see." Hadfield's wife Helene Hadfield, speaking from Houston on May 14 just hours after her husband's landing, told SPACE.com that the subject of a post-flight career didn't come up in their hours of ground-to-space phone conversations. "We're always thinking about the next step, but really, at this point, all I know is anything Chris does is always an adventure," she said. "No matter what he does, he really likes what he's doing. It'll grow organically, but right now all he's thinking about is this mission." Hadfield's stay on the International Space Station ­— which included commanding the Expedition 35 mission — made headlines worldwide. The astronaut, in between running a productive science mission, found time to play mini-concerts, chat with celebrities from orbit, and post hundreds of pictures on Twitter. Hadfield has shied away from talk about his future in the weeks since landing. In a press conference three days after he returned to Earth, Hadfield told reporters he was too busy focusing on recovering from microgravity's effects to think about what to do after the mission. "I'm trying to stand up straight, and I have to sit down in the shower so I don't faint and fall down," Hadfield said May 16. "It's like asking an infant if they're ready for their Ph.D. yet. I'll get there, but it's too early to say." It's questionable that Hadfield would go to space again as a government astronaut, experts say. There are two rookie Canadian astronauts — Jeremy Hansen and David Saint-Jacques — who are in training and awaiting flights themselves. Expedition 35 Commander Chris Hadfield of the Canadian Space Agency (CSA), left, Russian Flight Engineer Roman Romanenko of the Russian Federal Space Agency (Roscosmos), center, and NASA Flight Engineer Tom Marshburn sit in chairs outside the Soyuz Capsule just minutes after they landed in a remote area outside the town of Dzhezkazgan, Kazakhstan, on Tuesday, May 14, 2013. Canada is only entitled to a small number of flights compared to the larger contributors to the space station: NASA, Roscosmos (Russia's space agency), the European Space Agency and JAXA (Japan's space agency). Canada's "credits" for spaceflight come through its science and its robotics contributions to the station, CSA interim president Gilles Leclerc told SPACE.com in May. Canada's 2.3 percent utilization right of the orbiting laboratory entitles the country to a send another astronaut to space around 2018, but Leclerc said he is negotiating for an earlier date — perhaps 2016. Commercial spaceflights might be possible for Hadfield, who is a former NORAD fighter pilot. In May, Virgin Galactic hired four-time space shuttle astronaut C.J. Sturckow to conduct flight training and testing with SpaceShipTwo, a suborbital spaceship under development. Still, Helene Hadfield said it was premature to talk about her husband piloting a commercial ship. "It's not the time to go into a commercial company," she said, citing the months of debriefing, rehabilitation, touring and other post-flight activities Hadfield faces. "Maybe in the future, but he's so happy [with the CSA]. He has nothing against that, but the timing is not really right for right now." After his third spaceflight, Garneau, Canada's first astronaut, chose to leave space traveling for the management echelons of the Canadian Space Agency, where he later served as president for four years. His reasoning for leaving was it would be a long wait for a fourth flight, Garneau told SPACE.com. Additionally, Garneau wanted to bring his young children, who had been living in Houston, back to Canada. If Hadfield did turn to politics, Garneau — now a Montreal-area member of Parliament for Canada's Liberal party — pointed to a change between an astronaut's public persona and that of a politician. As an astronaut, he said, "you're a fairly popular figure in the sense that people like to hear from astronauts and to hear about space." Garneau, in fact, partially made a living as a speaker in between an unsuccessful attempt at winning a seat for the Liberals in 2006, and his successful election in 2008. "But when you enter politics," Garneau added, "you identify yourself with a particular party, particular values, particular policies. At that point, you're open to being criticized by people." Hadfield's next journey will be to Russia in early June, as the astronaut begins debriefings at various space agencies that contributed science to the mission.